Start off your visit on the 15th (Mon): admire the masterpieces at Vancouver Art Gallery and then wander the streets of Granville Island. For ratings, where to stay, photos, and more tourist information, refer to the Vancouver online itinerary creator. Johor Bahru, Malaysia to Vancouver is an approximately 27-hour flight. You'll gain 16 hours traveling from Johor Bahru to Vancouver due to the time zone difference. Expect colder temperatures when traveling from Johor Bahru in May; daily highs in Vancouver reach 19°C and lows reach 10°C. 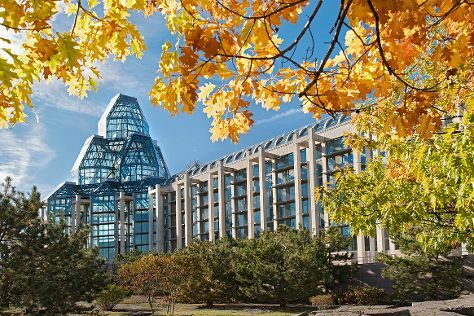 On the 16th (Tue), you'll have the morning to explore before heading off to Ottawa. Start off your visit on the 17th (Wed): get engrossed in the history at Canadian War Museum, examine the collection at National Gallery of Canada, and then take in the spiritual surroundings of Notre Dame Basilica. To find photos, traveler tips, maps, and more tourist information, refer to the Ottawa trip itinerary maker. You can fly from Vancouver to Ottawa in 7 hours. Alternatively, you can drive; or take a train. The time zone changes from Pacific Standard Time to Eastern Standard Time, which is usually a 3 hour difference. Traveling from Vancouver in May, you will find days in Ottawa are a bit warmer (24°C), and nights are about the same (9°C). Finish up your sightseeing early on the 18th (Thu) so you can travel to Toronto. Start off your visit on the 18th (Thu): explore the historical opulence of Casa Loma and then examine the collection at Royal Ontario Museum. On the 19th (Fri), you'll have a packed day of sightseeing: examine the collection at Hockey Hall of Fame, appreciate the extensive heritage of The Distillery District, and then admire the landmark architecture of CN Tower. To see photos, ratings, other places to visit, and more tourist information, read Toronto travel itinerary planner. Fly from Ottawa to Toronto in 3 hours. Alternatively, you can take a train; or drive. In May, daytime highs in Toronto are 23°C, while nighttime lows are 13°C. Cap off your sightseeing on the 20th (Sat) early enough to travel to Canmore. Do some cultural sightseeing at Cave and Basin National Historic Site and Buffalo Nations Luxton Museum. Let the collections at Banff Park Museum and Whyte Museum of the Canadian Rockies capture your imagination. Explore Canmore's surroundings by going to Lake Louise (Lake Louise & Moraine Lake) and Banff (Banff Indian Trading Post, All In The Wild Gallery, & more). For ratings, maps, photos, and other tourist information, you can read our Canmore vacation trip planner. Getting from Toronto to Canmore by combination of flight and bus takes about 8.5 hours. Other options: drive; or take a bus. Traveling from Toronto to Canmore, you'll gain 2 hours due to the time zone difference. Traveling from Toronto in May, you will find days in Canmore are slightly colder (15°C), and nights are cooler (0°C). Wrap up your sightseeing on the 22nd (Mon) to allow time to travel back home.